Kennedy and King traces the emergence of two of the twentieth century's greatest leaders, their powerful impact on each other and on the shape of the civil rights battle between 1960 and 1963. 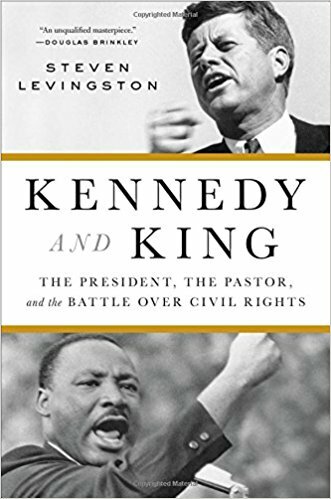 Levingston's writing on King is unfailingly perceptive and eloquent, looking clearly at his flaws (mainly vanity, and a penchant for histrionics that's endemic to Southern preachers, even Boston University-educated ones) while conveying on every page his greatness. The main problem with the book is that its story is lopsided: in these pages, King has both the vision and the courage to pursue it in the face of all obstacles. Kennedy, on the other hand, presents an imbalance not even the most sympathetic writer can fully right ... Levingston is aware of this uneasy dialectic, of course, and he treats it with the complexity that it deserves. His version of JFK is a man whose pragmatics are constantly at war with his idealism, and thanks to Levingston's impressive narrative skills, the spectacle of this president confronting the most divisive issue of his day is consistently fascinating. Levingston writes with passion and flair. If these pages don’t rouse you, call your doctor ... There are places where Levingston the writer (displaying the occupational weaknesses for stark contrasts and sudden twists of drama) gets the better of Levingston the historian ... Levingston’s frame does not fit, but he is too good a writer to get in the way of his history for long. Kennedy and King will most likely leave readers thinking that what is needed today is not more leaders, a few men and women shaping our destiny, but more followers. What did you think of Kennedy and King?